Safari is a crowded market, as almost all the African countries offer a similar safari product. Rookie safari-goers have a checklist to guide them on the way and to distinguish the honeypot natural parks from the others. Once the stimulus for entering the safari game was the need to see the big five, named from the days of hunting when they were the five most dangerous animals to hunt, buffalo, elephant, leopard, lion and rhino (the most elusive of all). Nowadays they have become the five tourists most want to photograph. There is a linked little five bearing names like the big five for the more observant, buffalo weaver, elephant shrews, leopard tortoise, ant lion and rhino beetle. The stadium event of safari is the Serengeti migration in Tanzania and across the border in Kenya, a great circular motion across a national park the size of Munster, and the neighbouring plains and savannah woodland in the adjoining Ngorongoro Conservation Area. The charge is led by the zebras, advance guards of the migration. They eat the taller grass, chasing away the tsetse flies that harass the thinner-skinned wildebeest that in turn eat the shorter grass. They all have different talents. Zebras can see clearly, wildebeest can’t but have a sharp sense of smell, while gazelles have good ears. Serengeti gets its name comes from a Masai word for ‘endless plain’ and contains 2.5m animals, a million and a half wildebeest (also known as gnus), half a million zebras, and hundreds of thousands of assorted gazelles. And there are also tourists, in lines of buses and land rovers, here to feast as well. The Serengeti migration is one of the greatest events you can plan to witness. The pickings are rich. Lions, hyenas and crocodiles wait at convenient points on the riverbanks, licking their lips. The migrants push as far as the bank and wait. Then the throng becomes unstayable and the leaders are pushed forward. Many migrants are eaten; others panic and drown. From the assembled human gallery there are football cheers when a gnu gets through. BOTSWANA The best organised of the safari destinations, with well-managed wildlife, national parks and well-run tourist concessions, Botswana is a little pricier than many of its rivals but then it has some of the best wildlife. Famous for the Okavonga Delta and the Kalihari Desert. Years of stability and prosperity have made this a popular if pricey dual-centre destination with South Africa. Regarded as the best organised and most sophisticated safari of all. KENYA Lots of options with more than 50 National Parks, the Rift Valley, magnificent Samburu region, Masai Mara and half the famous Serengeti. 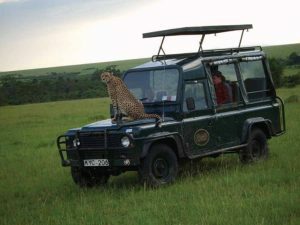 Beach safaris, cultural safaris, adventure safaris, scenic safaris and all the animals. Most of the beds are on the Kenyan Masai Mara side of the Serengeti, with very good connections through London and Amsterdam. LESOTHO Mountain kingdom with strong Irish connections. MALAWI Inexpensive, beautiful and varied, famous for its divine lakeside lodges, including Likoma Island where the nicest plunge pool on the planet might be that at Kaya Mawa Lodge. MADAGASCAR Gaining a reputation as a beach location. The best known movie about the place may be an animated kids cartoon, but check the unique species – most famously lemurs. MOZAMBIQUE Last great wilderness, with thousands of square miles of unspoilt forest in the west, and with 2,500km of beaches on the east tourism has jumped back to action. Limited safari but check out the eco-lodges along Lake Nyasa, are accessible from Lukomo Island in Malawi. The Nyasa National park is accessible only by light plane. NAMIBIA The big empty, ten times the size of Ireland and among the most arid places on earth. Pricier than South Africa, big and empty with a beautiful Namib desert and one of the oldest landscapes in the world. Fish River Canyon is the second largest in the world after the Grand Canyon in the USA. Suitable for self drive, it is astonishing to come across Bavarian villages at the empty of the empty expanse, where you can drive seven hours without meeting a vehicle. S AFRICA Big Irish favourite, with nearly 60,000 visitors annually and decent air connections through London and Air France’s A380 service from Paris. Most Irish visitors end up in the Cape which is not really a safari destination, although there are lots of private game reserves. Kruger National Park in the north east is the most famous real safari location, Blyde River Canyon nearby is the third largest and only green canyon in the world. Kwazulu Natal has among the most ancient sites in the world, the iSimangaliso / Greater St Lucia Wetland Park and Hluhluwe Reserve, the best in the Republic. SWAZILAND Mountainous and untouched by progress even by local standards. TANZANIA Regarded as traditionally more expensive than Kenya, although this is disputed since the arrival of more beds in the Serengeti. Other signatures are to Mount Kilimanjaro and the Ngorongoro crater. Home to a huge range of animals including chimpanzees, now rarely seen in the wild. Zanzibar is promoted as a travel destination in its own right. ZAMBIA Ideal safari location with 20 national parks, an unspoilt tourism arrival. ZIMBABWE Access remains good. Although political instability and isolation have created problems for the holiday sector here the safari centres soldier on. The American dollar is now the unit of currency (you can buy a defunct 500 trillion Zim dollar note from a market stall) which has created small change problems but the currency situation is much better than it was.